Although the distribution and migration patterns of Atlanto-Scandian herring have changed during the last decades, it may be fruitful to study their common characteristics based on situations observed in the 1950s when the stock was at a high level. rise into the upper layers and drift northward (Fig. 11.2). Under favorable recruitment conditions, most of the larvae are found in the Barents Sea. Spent herring (that is, post-spawning) migrate northwestward into the Norwegian Sea where they feed on zooplankton. Larger individuals reach the Polar Front in June-July and some of them cross into cold waters. The feeding area extends from Spitsbergen to Jan Mayen in the north to the western borders of the East Icelandic Current to the south. During the fall, the feeding area shrinks and the herring concentrate in the southwestern part of the Norwegian Sea along the southern and southwestern borders of the East Icelandic Current. Norwegian spring-spawning herring spend the winter off the east Icelandic coast. In December and January prespawning concentrations migrate toward the Norwegian coasts. Course and speed of spawning migrations are regulated by optimal surface temperatures in the range of 6-8°C. 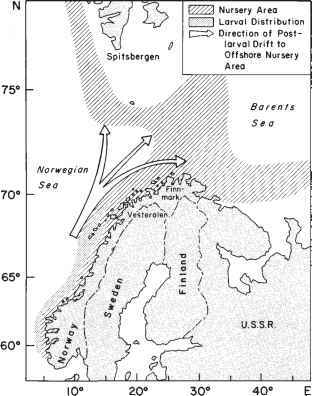 Devoid (1963), describing these migrations in detail, found that herring gather in cold water pockets before crossing the warm Norwegian Current into colder coastal waters. Usually, the herring approach the Norwegian coast (off More) and then spread to the south and north. The described migration pattern is normal, when the stock of Norwegian spring-spawning herring is at a high level. The decline in stock, which occurred during 1950-70, resulted in changes in migration, distribution and location of spawning grounds. From 1950 to 1962 the spawning grounds of the Norwegian spring-spawning herring gradually moved northward; since 1959, spawning south of Bergen (Norway) had been negligible (Dragesund, 1970). In the second half of 1960s a separate component of stock was found in addition to the main one. It had a distinct feeding and wintering area south of Bear Island. 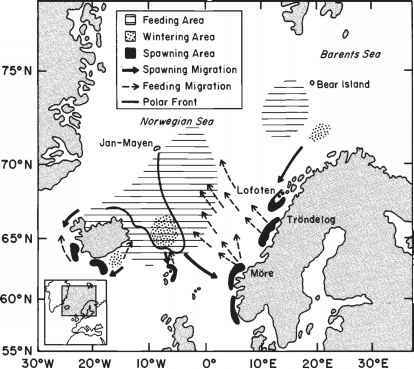 Between 1965 and 1969, the herring fed mainly in the Spitsbergen to Jan Mayen area (Anon., 1978). In late autumn the herring gathered, as before, in the traditional wintering grounds off eastern Iceland. Sharp changes in migration patterns took place in the 1970s, when the stock was depleted. In 1972 spawning was negligible. Two components of immature herring revived after the overexploitation of the 1960s: the first one in the Barents Sea and the second one off the western Norwegian coast. Both of them spawned for the first time in 1973; the Barents Sea (northern) component at Lofoten, and the Norwegian (southern) component off More. Unlike the previous years, the spent herring did not leave the coasts but migrated into interior waters where they fed during summer and fall. After 1983, when relatively rich year classes added to the spawning stock, separation into two components was not observed (Hamre, 1991). In the summer of 1988 Soviet vessels found herring schools to the north of Iceland, southeast of Jan Mayen. Sometime later, Norwegian purse seiners, returning from fishing near Iceland, reported sighting herring shoaling on the way to the Norwegian coast. To validate this, a Norwegian research ship collected data which indicated that at that time there were more herring along the coast than there had been at any time since the mid-1960s (Anon., 1989). It should be noted that in 1989 the small component of Norwegian spring-spawning herring spawned at the southern grounds for the first time since 1959 and that spawning began rather late (in the first half of March). During the 1970s, the individual rates of growth increased. For example, the herring of the 1969 year class reached 36.5 cm in length compared to 34 cm at the same age in the 1950s and 1960s. At the same time the average age of maturation declined from six to seven years in the 1950s to four years in the 1970s (Bakken, 1983). Icelandic spring-spawning herring should probably be considered as a component of Atlanto-Scandian herring living at the outer limits of its distribution (Jakobsson, 1985b). Usually this component is relatively small, but it can reach high levels of abundance under favorable environmental conditions in Icelandic waters. This herring stock spawns in open waters off the southern coast of Iceland in March-April. By June, after spawning, herring move to the north coast of Iceland for feeding. There, the herring mix with the feeding Norwegian spring-spawning herring, which migrate to the same area. In late fall the mature fish begin their spawning migrations to the south coast. Icelandic summer-spawning herring spawn in July-August, mostly in the same location as the Iceland spring spawners. In fall the spent herring migrate to the north. At this time their area of distribution overlaps with that of the spring-spawning stock.